The Crooked Banana: Yay Finishes! A week of finishes. All drawstring bags were made with this tutorial. 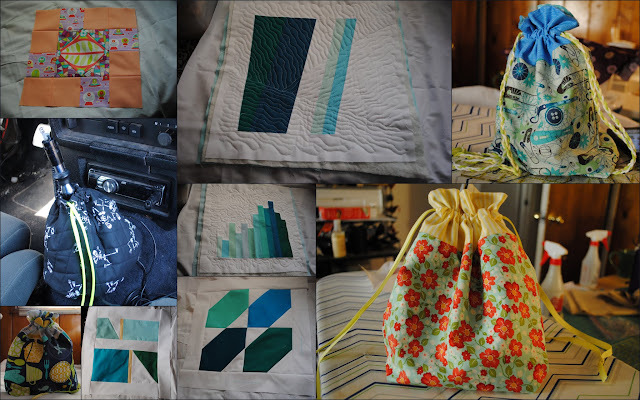 I had an extremely busy sewing week! Above is a little mosaic of everything I completed. From top to bottom, left to right: 1. Sister's Ten BOM February block; 2. Quilted shift boot cover; 3. Drawstring bag; 4. Skill Builder BOM "Mood" block; 5. Quilted Skill Builder BOM "Magnum" block; 6. Quilted Skill Builder BOM "Sound Wave" block; 7. Skill Builder BOM "Em Dash" block; 8. Drawstring bag for my dad; 9. Drawstring bag for my boss's birthday. It's turning out so good! Just like I imagined it. And I was very careful with all the directional animals and cut them so that they would be facing the right direction for both vertical and horizontal windows. It's going to be fabulous! I wish I could stay home and work on this all day, but today is the last day at my part time job. It would be sad to miss it! I think I can at least get the top done this weekend so I'll post a nice picture of it when it's done :) My sister's birthday isn't until mid April, so this is going to be done super early! Linking up to Finish it Up Friday at Crazy Mom Quilts! What a good week for finishes. Now to go look at all the other eye candy until work time! Those blocks look even more amazing than I imagined they would! Hooray! All the corals in those blocks are so pretty!! Great job on all your finishes.